Posted By:Unknown | At:2:47 PM Be the first to comment! All across the world people are rising up to challenge what they preceive to be unfair practices implemented by their government and society. It was only a matter of time before those protests reached America's shores. It would appear the movement has come in the form of 'Occupy Wall Street'. Much like the Tea Party, Occupy Wall Street started off as a small group but slowly but surely it's ranks are increasing and it's becoming more organized. With people like Van Jones, Michael Moore, and Bill Maher giving voice to their cause, the movement is surely to pick up steam. We here at The Savvy Sista stand firmly behind this movement and what they are trying to accomplish because at the end of the day the vast majority of us are '99percenters'. 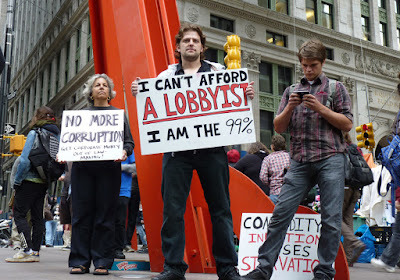 To support and learn more about 'Occupy Wall Street' click here. Occupy Wall Street is an ongoing demonstration opposing corruptive corporate influence over U.S. politics, the monied corruption of democracy and a lack of legal repercussions over the global financial crisis. It was initially called for by Adbusters, an anti-capitalist group based in Canada, and was inspired by the Arab Spring movement, particularly the protests in Cairo's Tahrir Square which resulted in the 2011 Egyptian Revolution. The protest has since grown to draw the support from a diverse group of demonstrators from various social and political backgrounds. The aim of the demonstration is to begin a sustained occupation of Wall Street, the financial district of New York City, to protest perceived corporate greed and social inequality. Organizers intend for the occupation to last "as long as it takes to meet our demands." Demands are in the process of being negotiated and developed. On October 1, Similar demonstrations were held in Washington, Los Angeles, and Portland, Maine.